Sigyn sat upon a large green hill, her fingers smoothing through the bright pieces of grass. Tugging ever so slightly she pulled a few of the pieces up from the ground and let them go with the wind, a slight smile flickering on her lips. Watching the pieces twirl and get carried away like two dances a quiet laugh like the peal of bells fell from her lips"The night is so lovely..." She spoke to the open air and slowly lent back on her elbows, peering up at the sky. Most nights she would come out and watch the stars, pointing out constellations and naming what planets were what. The stars were so fascinating to her that's why she studied them so in depth, to expand her knowledge so it only made her want to learn more. Sword fighting and Astrology are where she excelled aside from the practice of magic, she was quite proud of her other talents. It got lonely though, not having someone to practice with or talk to, she mainly kept to herself. The ever loyal goddess, protector, and even wife to the one that went away. She always held hope he'd return one of these days, to end the loneliness that weighed upon her soul. "My dear Prince, I wonder what kind of mischief you are up to now.."
Often keeping his own council, Loki had left one thing, one person, unattended. It was about time he face his wife. It seemed that he had given her little thought to her in recent times and for the most part, that was true. But his mind had wondered to her on occasion and it seemed clear to him that it would be wise to keep her distanced from him and out of all of this. There would be no point in getting her caught up in a cell for helping him. After all, he may need her free for later plans. It served him best to have her free and within the good eye of the king. Still, enough time had passed, the trickster suspected for him to be able to take action. Slipping out of the cell, past the tired guards (a sign that night was indeed approaching), the prince walked through the darkness, cloaked by magic. He passed unseen through the halls of those he had once believed to be his blood. 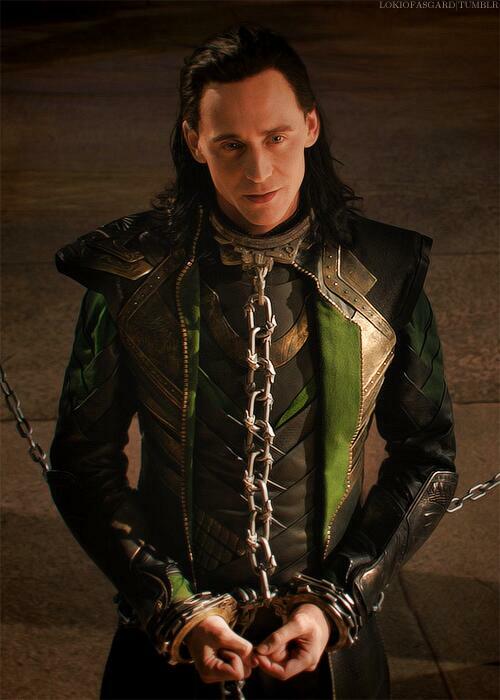 Although he did not know where his wife would be, Loki suspected that she would either be in her chambers or outside. Of course, outside was large and after a moment of thought, Loki decided he would be served best by scrying for her. Moving to what had once been his rooms, Loki checked for any traps then slipped inside, found his tools for scrying, checked these for traps and then drew on his magic to find the location of Sigyn. A grassy hill outside the citadel. He knew it well. Still hidden from view, Loki left his old chambers and with haste made towards her location, moving through the city with ease. He knew the paths well and it took little time for him to come to the hill. Here, he dispersed the illusion and looked up the hill. It was without trees and safe for flight so he shifted his form to a falcon and flew to the top, landing gently and returning to his natural form. A smirk crossed his face as he overheard the words of his wife and silently he moved forwards, sitting down besides her. "Not much it seems. I hear he had to check up on someone," Loki said with a grin on his face, referring to himself in the third person with some mischief in his eyes. The soft rustle of the grass caught her attention, and slowly one of her hands drifted to the satchel at her hip in case she needed a dagger or two. Though that familiar tone of voice had taken the air from her lungs in a audible gasp. "Your highness, you're here!" She murmured in awe, using formalities out of habit. She immediately turned to face him, smiling brightly as her blue gaze swept over his frame. "You look well if I might be so bold." Sigyn murmured and hid a pale blush. "What have you been up to? Anything fun?" The smile turned into a grin as she waited to hear where his travels had led him and if anything of interest had happened. All the stars in the sky couldn't match her glorious Prince in his dashing green and gold. He was like a star himself, mysterious, interesting, and oh so bright. There was no denying that Loki enjoyed formalities, being reminded of his power and as such he never bothered to correct his wife - she had no need to remain so formal with her husband and to be honest, his claim to the Asgardian throne was sketchy at best. "Here in the flesh," The trickster said, his words silkier than he usually had them. They were without company and Loki was more willing to show his true emotions when he was free from prying eyes. "It's not like I could leave the most beautiful woman alone on such a beautiful night," He said, honeying his words - he knew well how to use his words to manipulate others, to make them like him and he loved using this talent. Green eyes met hers as she looked over him and he was reminded why he had gone to such lengths to win her hand. She truly was a rare beauty and her wards, her formality, certainly pleased him. "You may," He said as she commented on his appearance. "And you look as radiant as every, my dear. The heavens must look down on you in wonder." He replied, enjoying weaving his words as he spoke. Her beauty was true and he needed to make sure that she would remain loyal to him for all times. A smile spread across his face at her question and for once, it seemed as if recent events had faded away. As if he wasn't imprisoned here, as if he hadn't tried to take over Midgard and as if he hadn't been thrown from the bifrost. "I've been going through the nine realms but I have had to frequent Midgard more than I desire. Their people have changed and near forgotten us and some of the stories they tell paint a certain someone in a not so pleasant light. So I've also been dealing with that. But I do regret that it has kept me from you," He said, again using his words to compliment her. Such a flatterer Loki was and Sigyn loved it. A soft rush of blood colored her cheeks in a blush, making her otherwise pale complexion a bit more rosy in hue and it was very appealing. "You've missed many a beautiful night my dearest King..I am glad you are here though." Her voice turned soft and feathery when she spoke the word king, a mischievous glint gleamed in her blue gaze. She rather enjoyed addressing him as a king because she believed him worthy of the title more than the brother who claimed it. Another compliment and her blush deepened with the flattery, her blue gaze dropping to her hands sheepishly. Tucking a strand of raven black hair behind her ear she giggled a bit, the sound again like bells. "I thank you my love..there is such kindness in your words." She murmured sweetly, raising her blue eyes to peer at him beneath her dark lashes. Loki's smile made her smile as well, bright and happy with his words. She had longed to see him smile or hear him laugh about some trick he pulled on an unsuspecting being, it was always amusing to her. "I understand you are busy, but I will always be here when you return if you so require my company." It delighted Loki to see the blood flow into his wife's cheek, a sight that he was fortunate to see with the darkness that surrounded them and he smiled. Few sights could compete with such beauty in his mind although her loyalty was most dear to him. For a second, it crossed his mind that he may indeed show weakness if someone was to gain control of Sigyn but he doubted that would happen and if it did, he would talk his way out. In the end he knew he wouldn't allow anything stop him. A satisfied smile crept upon his face as she called him King and he leaned back slightly, appearing to be more at ease. "Then let us make this night the most beautiful of them all," Loki suggested with a grin. Turning away from his wife, the trickster lifted one arm and held a clenched fist before him. Sending a breath of air onto his hand, opening it, her created the illusion of a shower of stars leaving the palm of his hand and forming the image of Sigyn and himself in the sky above them. With a wave of his hand, he added some colour to the illusion of stars and the illusion of the aurora behind them. Magic had many different uses and Loki rarely used it for such trivial reasons but he did enjoy a bit of trickery. Green eyes searched her face as his wife's blush deepened and she looked down. There was a pause and then Loki raised his hand, using it to lightly hold her head and brush her blushing cheek. A soft smile came across his face at her laughter. The more rare and caring side of him could be shown in this privacy. "There are few worthy of my kindness, my sweet. And I am glad for it means I can give it to you." He said, still keeping his voice sweet and his words honeyed. Head turned slightly at an angle as Sigyn spoke and he took in her words. He gave a small sigh. His life kept him far away and busy. "I will return when I have time but I am not seen in too popular a light and this needs to change. I would rather not leave you to feel the aftermath of my actions." He said, keeping his voice more casual this time. No point in making it seem any worse than it as. Leaning her cheek softly into his touch her bright eyes closed for the briefest of moments. "I am glad for that, the time and kindness you give." she murmured and smiled softly. Turning her head slightly she pressed a soft kiss to his palm, listening to him speak, assessing the words for herself. Drawing a gentle breath into her lungs she waited until he was finished speaking to take her turn again. Reaching out she placed her hand upon his cheek, a mimic of what he had done to her, a comforting and loving gesture. "No matter what you've done, I'll still be here. Waiting for your return, everything you do is for a reason I'm sure." Changing the topic she sat up a bit more and held out her hands, summoning the illusion of a raven there. "I've been working on my illusions, they aren't any where as good as yours but it's slow progress." She mused and let the Raven fly about for a moment before it would flutter to a stand still at her right shoulder. It didn't last long and faded out after a moment, vanishing into a mixture of gold and green dust. Spells were the life blood of the trickster. They gave him his tricks, protected him and also gave moments of entertainment, tricks to be used to please others. Not that he often tried to impress others. He cast his mind back to the last time he had done his little spells for the entertainment of others. It seemed that it had indeed been many years since he had done such simple tricks for pleasure. It was a shame. Green eyes watched it in amusement and peace as he kept up the magic, with little thought to the effort it take; now such tricks were just like breathing to him. Not something that he even needed to give a thought to. He smiled, watching it with an almost peaceful smile. "How far have you gotten in your studies?" He asked, honest interest in his voice. He had never been a teacher; for some reason he was not trusted enough for that but he was willing to help his wife learn. At least with her he wouldn't do any of his dark tricks. He would honestly be trying to help her. Watching the raven that she had summoned, the trickster gave a nod of approval. "You need to see the detail, to know the detail within your heart." He suggested, his voice soft as silk. As his hand lightly held her face, the prince took the time to think about the warmth of her face and the blood that had flowed into her cheek. Warmth. Tender warmth. It put him in mind of a delicate flower in a summer's evening. It really had been too long since he had seen his wife. He knew that he probably felt that his wife was warmer because of the fact that he was a Frost Giant... a Jotun. He still had not completely accepted his heritage, his birth. Eyes closed and he ran his thumb gently along her cheek, forgetting about the complications. Tonight they could pretend that it was the past and that recent events had not taken place. Eyes flickered open as Sigyn addressed him by name and he looked deep into her eyes as she spoke to him. While it was good to hear that she could defend herself, he would have rather that such situations did not occur. A small sigh escaped his lips and her felt his wife kiss the palm of his hand. "All the same, if it gets too much, then tell me who it is and I can deal with them for you," He said, a smirk on his face and a hint of darkness in his voice. He did love to deal with others, whether it was by death or a particularly harsh trick. Following his wife's example, Loki too lay down on the ground, lightly touching her shoulder with his hand and offering her a smile. Watching him she smiled softly. "I've gotten to a suitable range in my studies, though it at the same time is not enough." Replying with an almost sigh her eyes flickered softly. "Her majesty Frigga still teaches you, does she not? How powerful is she?" Sigyn asked out of curiosity of her husbands teacher. He was so interesting to her and she always seemed to have a new question, each answer just as thrilling as the next. Her curiosity alight the goddess couldn't help the next question that fell from her soft red lips. "..Is what they say about you, true Loki? About being..well.." Trailing off her black brows furrowed with her restraint at prying, she made a soft noise as she cleared her throat. "I apologize for rudely prying, overly curious I suppose.." Sighing she took his hand in hers, lacing their fingers together. Her cheeks turned a soft red in embarrassment, she didn't want to shame herself by asking too much at once. Magic as a true skill and art, as Loki knew and he wanted to make sure that his wife had enough education to make sure she could defend herself if needs be. After all, he needed her to be able to watch his back. Plus magic had the added bonus of entertaining and life was likely to be much less entertaining without him around. "If you need any assistance, I would be happy to offer you my services." He offered with a grin. The trickster did love to have the chance to show off and teaching magic was definitely something he could so while making a show of his power and skill. Plus it would be a nice gesture to make towards his wife, he considered. The topic turned to his mother and her skill and Loki let out a small sigh and smiled as he thought about her. "She is very powerful, more powerful than even me," He commented, voice calm as he looked into the sky. "But she is more gentle and does not use her powers for offense." He added, thinking about how she rarely used her skill apart from to train him and to talk to him when he was in his cell. Asgard had never really been under threat in his life time and he had not seen what his mother would do in time of war. Resting, he closed his eyes, simply enjoying being outside and with Sigyn when she spoke and his eyes open and he turned so he was on his side, supporting his upper body with an arm, looking at his wife with green eyes. "About my heritage?" His voice was cold now, the calm tone of his voice and body lost in those few words that she had spoken. She appologised and Loki let out a slow breath. "The fault is not yours, you have the right to know and must never fear asking me a question." He said, calming his voice. "But I must know what it is that you have heard and from who." This time his voice was more demanding. He needed to know this so he could deal with them and still, he had not answered his wife's question. "I would be honored to have your assistance my dear." She murmured and smiled softly, she really did feel honored when he offered his time to teach her some more about magic. Listening to him speak of his mother made her smile, he always had good words of the Queen. Sigyn viewed Frigga as a fair and just ruler, more so than her partner Odin, the woman could lead alone and no one would bat an eye. Though Sigyn would prefer to see her Loki on the throne, she see's him as being a strong leader for the people. Thor just seemed too unstable and foolish, no wisdom in him yet. "I wonder how she learned.."
Glancing up she took an even breath before answering him. Her tone remaining gentle but not shaken, she wasn't afraid. "I heard from a few guards whispered words, but mainly of a citizen most believe to be mad. His name is Hidmal. He rambles about much but more so of his visits with Odin. He spoke of you...being of..Jotun birth. Not Asgardian." Playing with her own hands she drew another breath into her lungs. "I shouldn't listen to the mutterings of some citizen but it made me curious. Though as my mother used to say; Curiosity killed the cat, so ask me no questions and I'll tell you no lies." Trailing off the goddess ran a hand through her dark hair, lips pursed slightly as she let her eyes wander back to him. A smile spread across his features as Sigyn said she would be honoured to have him as s teacher. It was a rare offer, that was for sure and he grinned. "So you desire to work with illusions, then," The trickster grinned. Illusions were often his preferred form of magic; it had gotten him out of many traps before and gotten others into traps themselves. It was a true tool of mischief and most certainly a lie. As such, it had been simply magic to him, an art he has mastered early and even now barely needed to give much thought to it. A simple instinct. Talking about his mother, brought a peace to Loki. Out of his old life, only two people he held in the same view and that was the two women in his life; Sigyn and Frigga. Neither had harmed him and he cared about them both equally. He knew that his once brother wanted for things to be like that between them but the trickster was not one to forget. It was the red clad hero that had tossed him from the bifrost, the very same hero who had forced him here to 'rot' in a cell for the remainder of his life. Actions spoke louder than words, after all. "I have not asked her but I find that magic can be explored without a teacher at times. Books, guides, they help one to learn and master but only experimenting can lead to discoveries." He replied calmly. Having got the information that he needed, Loki's thoughts turned to what he could do. Hidmal sounded like a minor problem - the guards were more likely to be believed but Hidmal was the one spreading the rumour. Killing him would make others ask questions. Confronting him... maybe in the guise of the king or prince would do. He could find out how Hidmal knew, follow that. And then he could always leave a little present for Hidmal. A little bit of a game to further ruffle the man. A smirk came across his lips. "Thank you my love," Loki said, lowering his voice slightly and turning to kiss her on the neck, gently. He did love the woman and he also knew how important it was to reward those who brought him information, especially some as valuable as this. If he were to gain the throne, then he would need nothing that could question his claim to it. And the issue of his heritage certainly could. As she spoke about not asking questions, Loki gave a nod of his head. He approved. He did not want to share his true nature with anyone, including his wife. Maybe one day or at her request but it was something that he did his best to forget. "Well, I am going to need your eyes and ears, my dear, to find out just what the public think about me and their current king." He said, putting a honeyed tone into his words as he whispered to her. Sigyn grinned back at him and gave a soft nod. "Yes I do. It's very interesting to see you do those tricks and I'd like to be at that level some day" she mused and giggled a bit. "Though it would be difficult, you are great at what you do~" She already had magic in her but it was for fighting that is what she trained herself for, though she wanted to expand her knowledge of the craft. Listening to him speak of his mother, answering her question she nodded softly. "That is true yes. Frigga does read a lot..she could be studying magic." Shrugging she brushed one hand through her own hair, smoothing the ebony locks with care her soft green eyes watching her husband as he looked to be in deep thought. When he thanked her for the information provided she flashed a soft smile and blushed at the kiss pressed to her skin. Moving closer to him she lightly rested her head against his chest, her dainty hand moving to trace the ridges of his armor. "I will do my best, dearest. As I always do." she murmured in soft response, her eyes fluttering closed. She was a bit disappointed she didn't get to know anything more but wouldn't press the subject unless she felt she needed to know more only then would she ask him again. Paying close attention to his wife, Loki gave a nod as she confirmed that she would like to learn the art of illusion. To become as powerful as he was. Letting anyone become as powerful as himself was not something that he intended to do but teaching her was important. "They say you've got to imagine it but that's only the lighter part of the magic. You actually have to believe that the illusion is there yourself, put a part of your own soul into it, especially if it's an image of yourself. Just remember to retract your soul once the illusion's purpose has been completed. It becomes automatic after a while." he explained calmly. To him, this was all second nature. "Books are one of the best way to learn but the personal touch is useful." He told her. After all, magic was a contentiously flowing and changing art. True there were fixed points but there were subtle differences between all of them. Feeling her head against his chest, he moved to place his hand on her back. Remaining like this, his green eyes looked up at the sky, aware of the presence of his wife against him. It was peaceful. Calm. Such an unusual feeling. "Good, my wife," He agreed. "I have no doubt that you will do your best, no matter what." Keeping her eyes closed she listened to the sound of his heart for a few moments. "What can I do to improve my magic, merely practice?" she asked lightly. She was very glad for his company and his patience, she found it hard to keep herself busy when she worried while he was away. Never did she want to hear them tell her he had perished in some battle, that was always a fear in the back of her mind. Pressing her lips together she gripped the edges of his armor as if she had panicked herself. Releasing a soft breath she opened her eyes again, staring forward at the grassy hill and the stars. In her silence she counted them, each bright jewel as lovely as the next. Breaking herself from this habit she glanced up at him. "My King, might we dine? I am peckish.." she murmured her voice like silk as she used the title of king. Raising her head and torso she sat up, gazing at him with a soft smile. Remaining silent and still as his wife lay on his chest, green eyes stared up at the sky, taking in the simple beauty of the heavens. "Practice makes up a large part of the learning curve," He agreed, hand gently stroking the back of the woman who lay on his chest. It was strange to think that so long he had rejected any sign of the old him. The side that had been kinder. But this was the woman that he had picked out and cheated to get. "But the knowledge is important. The more you know, the safer it is." He warned her, wanting to keep her safe from anything that might harm her. He was only shaken from his silent musings but the words of his wife and with a wave of his hand, the trickster pulled a feast out of the air. It took some effort; this was a range of foods and not just a simple drink or illusioning a chair into a throne. His eyes closed at the effort and he drew in a long breath. The food was laid out as a picnic and he lay still, waiting for his wife to take the first move. The smell of food was tempting though. He didn't get enough to eat in the cell, in his opinion. Not enough proper food, at least. Nodding to his words cautioning her, she smiled gently. "I'll be safe, don't worry." Nuzzling her head against his chest she embraced him for a long moment, finding comfort in him. Though her hunger got the better of her and she did removed herself, rolling away to sit up. Crossing her legs she glanced over the food and chose something to eat. She ate a small sandwich, rather distracted, her eyes scanning the sky now and again and then the surroundings. Dropping her gaze to a bowl of grapes she plucked one from the vine and leaned over to him, holding it out. "Grape, my king?" A playful smile crossed her lips at this action. Her soft green eyes lighting up with the same playful emotion, bringing them to life. She promised that she would be safe and he looked at her, green eyes scanning her features for a few seconds, judging her. It took only a few seconds; he could trust her to keep her word. She wouldn't go against something that she had promised him. It was one of the reasons that he trusted her and dare he even consider it, actually love her. He could trust her to not go against him, no betray him, to always serve him. It was a good to have a relationship where the other one was unwaveringly loyal. Wrapping his arms around her, thumbs moving to lightly rub her skin. The warmth of another being against him. The trickster frowned at this, wondering how rare it would be in the future, with his new reputation and the rumours about his birth. He heaved a small sigh. Simplicity had never been something that he enjoyed and certainly his life was no longer that. His lips pressed closer together at this thought. His wife went to get food and he remained on the ground, resting and staring into the heavens, a lazy eye occasionally moving to look at her as she moved. A smirk came across his features as her beautiful face appeared above him, grape in hand. "It would be most welcome," He said, voice silken and he raised a hand to trail along her arm and to the grape. She blushed delicately at his touch, then inwardly scolded herself for it. Feeding him the grape she smiled softly, her free hand brushing across his cheek lightly. "Seeing you is a welcomed sight my dear, you leave for so long." She murmured and pressed a soft kiss to his cheek. Fetching another grape she offered it to him again, happy with the calm evening. Eating a grape for herself afterward she beamed, fruit was one of her favorite things food wise. Picking up a glass of mead she sipped it contently, offering him one as well a moment later. Receiving attention fro his wife was relaxing and brought him some comfort. It had been an age since he had the chance to relax with her. In a way, it was an age ago. His life had been shattered by the revelation that he was not Asgardian, his world crumbled at finding out he was a frost giant, a monster according to the laws of their people. He had tried to destroy Jotunheim and then he had fallen into the bifrost. Then he had worked with the Chitauri to take over the Midgard. He had been lost to the eyes and ears of Asgard and when he had finally returned to the limelight, it wasn't long before he ended up in prison. Or more accurately, sneaking out of prison most of the time. Yes, it was an age to him. It seemed like an effort to simply slip back in to who he was in most occasions. The past few events had shaped him so dramatically. As his wife's hand touched his face, the trickster gave a soft sigh. Her skin was as soft as feathers and her kiss as beautiful as the raindrops that brought life to the earth. "Well, I doubt things will be quiet for too long," He said softly. "Although while it lasts, I can make an effort to visit on most nights. We can meet here. If I am free to walk, I will leave my sign on the sky for you, my dear wife." He whispered into her ears, wrapping his arms around her waist to pull her in closer so she may hear his words. Then he let out an illusion, leaving an image similar to the aurora seen on Earth, in bright shades of green and hints of gold. No one would think it was him apart from his wife. Releasing her, he took the second grape that was offered and sat up to take the cup of mead, a thoughtful expression passing over his face. "After we have feasted, my dear, would you like to take a stroll with me under the light of the stars. I know of a lake, private and secluded, hidden by the trees and rolling hills. It could be ours. A kingdom that I could shape for us. Or own little realm in a realm." He said, holding the mead, resting his arm on a bent knee as he sat up and gazed at his wife. It would only be for a night but the closer he kept Sigyn to him, the better. A smile soft and tender graced her pearl pink lips, her green eyes gazing at him. "That sounds lovely dear husband, at least I'd know you were alive and safe." she murmured, her fingertips lightly tracing the curve of his cheek. Giggling when she felt his strong arms move around her waist she relaxed, her eyes moving to gaze at the sky. Observing the beautiful shades of green and gold that colored the sky in a way that was unique but so very Loki. "I will keep an eye out for it." Moving when released she sat up, smiling at his words. "I would love to Loki, it sounds perfect." Finishing her cup of mead she set it away and rose to her feet in one fluid motion, graceful as always. Brushing off her dress lightly she offered her hand to him, excited to see but patient as ever. With his wife seemingly pleased with his offer of visiting more often, the trickster gave a nod of his head to this. He needed to make sure he had her loyalty. And her ear. It was useful to know the secrets that none would whisper around him. Too many would fall silent at his appearance. He needed to know what they said behind his back. A soft breath escaped his throat as he felt the hand run along his cheek, tracing the curve. He gently rubbed her back with his hand, humming softly under his breath an old love song. As she spoke, he smiled and gave a nod. He would try to meet with her more often. He did love her. As much as he tried to hide it. Standing up with his wife, he gave a nod, starting off towards the place he had described, using magic to light the way. The path seemed to glow with a soft green light that glowed around them, softly like the sun through the light green leaves that begin to bud in spring. "It is not a long walk if you know the secret passages. But otherwise it is a long journey. We shall not be disturbed whenever we are there," He softly said, offering his hand to lead her there. "Lead the way, oh cunning one." She grinned and took his hand, excited to see the place he had for them. Drawing a breath into her lungs she let it expand before releasing it softly, bright green eyes flickering with joy. "Thank you..for this my love" Her tone was soft with appreciation as she gave his hand a soft squeeze. "You know all the ins and outs of the kingdom, you are sure it won't be found by wandering citizens?" The concern was evident but she wasn't scared of anyone just didn't want anyone to be where they ought not to be. Especially if it was anyone that would pose a threat. Turning her gaze to the sky as they walked she for a moment, traced the stars. "Would the stars be the same.." She idly wondered aloud, a soft laugh passing her lips at such an odd thought. Glancing ahead once more she silently memorized where they were, in hopes of not getting lost later on. Grinning at his wife's words, the trickster lead the way forward, his footfalls light and making barely any sound on the ground as he moved. "I shall lead and I have the honour of being followed my the most faithful and beautiful woman in the realms and beyond," He said, leading her by the hand, gently as possible. At her question, he gave a small smile and dipped his head in answer. "None know the paths and the distance outside them is too great to travel casually but I can lay claims with spells to stop anyone from coming too close," He answered, his words honest with the woman that he loved and had chosen as his wife. Continuing, he lead the way towards the forest. The path to the secret place was in a cave in the woods. One of the passages, laced with the glowing rainbow crystals of the bridge lead to an underwater pool that glowed because of the crystals surrounding it. Diving into this lead to a private lake that had streaks of rainbow lights in it. Trees surrounded the pebbled beach of the lake and the air was clear and sharp. It was a good place. "Yes, the stars our still ours they glow the same and form the same stories," He answered as they moved into the woods. No danger would come to his wife while he was here and he would continue to protect her as best he could. Even if he was 'in' prison for the most of it. Sigyn was sometimes envious of his skills, able to be so silent and light on his feet. Though he would need to be to be the proper trickster and make a silent get away. Her curiosity got the better of her so she asked another question "What would the spells do, to someone who got too close?". Pursing her lips she glanced around the area, her gaze gleaming at the wondrous sight before her. The crystals caught her attention first and she was rather tempted to reach out and touch one, just to see what would happen. Giving her head a shake she smiled softly and continued walking along with him. Her hand giving his a slight squeeze, a loving and yet comforting gesture. Drawing a breath into her lungs she then exhaled in soft awe, a bright smile coming to her lips now as she took it all in. "I must say, this is quite stunning my dear King."